The design concept for the ANDREA air filter, previously dubbed the Bel-Air, was featured on Inhabitat two years ago in its prototype phase. We’re revisiting this savvy innovation since it recently came to fruition and became available for purchase this week. Invented by French designer Mathieu Lehanneur with Harvard professor David Edward, ANDREA transforms household plants into air cleaners which effectively rid indoor air of toxins and pollutants to purify baby’s nursery or any room in the house. As opposed to collecting pollution on a filter surface, the plant’s natural metabolic activity performs a biochemical transformation of waste which eliminates pollution. Any house plant may be used in conjunction with the ANDREA Air Filter to absorb and metabolize noxious chemicals, but the best performing varieties include: Spath or peace lily, Red-edged dragon tree, Spider plant and Aloe Vera. you could also just buy a plant, and open a window. Cool idea. I can't see this truly replacing HEPA filters, though. This seems like it would work for harmful gases, but things like cat dander/hair, pollen, etc., would still need to be caught by some other kind of filter (for those of us with allergies). I can see this product helping a home smell fresher, though. The design concept for the ANDREA air filter, previously dubbed the Bel-Air, was featured on Inhabitat two years ago in its prototype phase. We're revisiting this savvy innovation since it recently came to fruition and became available for purchase this week. 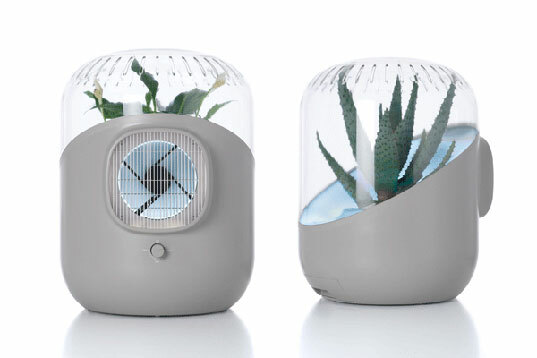 Invented by French designer Mathieu Lehanneur with Harvard professor David Edward, ANDREA transforms household plants into air cleaners which effectively rid indoor air of toxins and pollutants to purify baby's nursery or any room in the house.